The May Twin Size Bed Features An Arched Headboard And Footboard. Dunhill Bed in Autumn and Honey Oak Finish in Full Size. Includes Headboard, Footboard and Bed Frame. Headboard: 50H and Footboard: 34H. Strong Construction. Augusta l in Autumn Finish. Includes Headboard, Footboard, Slats, And Side Rails/Ctr Supp. Heaboard: 49H and Footboard: 33H. Available in Twin, Full, Queen and King Size. Strong Construction. Frisco Bed in Matte Black and Maple Finish. Includes Headboard, Footboard and Bed Frame. Headboard: 53 and Footboard: 37. Available in Twin, Full or Queen Size. Also Available (Not Included In The Price) Nightstand: 27H x 21W x 20D. Strong Construction. Headboard And Footboard (Full Or Queen). Night Stand (Optional). Strong Construction. Riviera Bed in Gun Metal and Acorn Finish. Includes Headboard/Footboard Grills and Posts, and Bed Frame. Headboard: 58H and Footboard 39H. Available in Full, Queen and King Size. Strong Construction. This 100 % Solid Wood Brazilian Pine Bed Is available in a Honey Pine and Mahogany Finish. This bed is Available in Two Sizes: Full (shown) and Queen. The Chest, Mirror, Dresser and Nightstand can be sold Separately. You Can Also Choose to have 2 Drawers or a Twin Trundle underneath the Bed. Full Size Bed: 82-3/4 In. (L). x 57-1/4 In. (W). x 39-1/4 In. (H). Queen Size Bed: 87-3/4 In. (L). x 63-1/4 In. (W). x 39-1/4 In. (H). Dresser Size: 33-1/4 In. (H). x 60-5/8 In. (L). x 17 In. (W). Chest Size: 52-1/2 In. (H). X 31-5/8 (L). x 17 In. (W). Mirror Size: 31-5/8 In. (L). x 44-1/2 In. (H). Nightstand Size: 20-1/4 In. (H). 18-1/8 In. (L). x 16-1/8 In. (W). The Drawers Underneath the Bed Size: (Each Drawer) 36-5/8 In. (L). x 18-1/2 In. (W). x 9-1/2 In. (H). Trundle Size: 74 In. (L). x 40-1/2 In. (W). x 6 In. (H). This 100 % Solid Wood Brazilian Pine Bed Is available in a Honey Pine and Mahogany Finish. This bed is Available in Two Sizes: Full (shown) and Queen. The Wardrobe, Mirror, Dresser and Nightstand can be sold Separately. You Can Also Choose to have 2 Drawers or a Twin Trundle underneath the Bed.Full Size Bed: 81-3/4 In. (L). x 58-1/2 In. (W). x 46-1/2 In. (H). Queen Size Bed: 86-1/2 In. (L). x 64-1/4 In. (W). x 46-1/2 In. (H). Dresser Size: 33-1/4 In. (H). x 60-5/8 In. (L). x 17 In. (W). Mirror Size: 31-5/8 In. (L). x 44-1/2 In. (H). Nightstand Size: 20-1/4 In. (H). 18-1/8 In. (L). x 16-1/8 In. (W). Wardrobe Size: 72 In. (H). x 39-3/4 In. (L). x 20-7/8 In. (W).The Drawers Underneath the Bed Size: (Each Drawer) 36-5/8 In. (L). x 18-1/2 In. (W). x 9-1/2 In. (H). Trundle Size: 74 In. (L). x 40-1/2 In. (W). x 6 In. (H). This 100 % Solid Wood Brazilian Pine Bed Is available in a Honey Pine and Mahogany Finish. This bed is Available in Two Sizes: Full (shown) and Twin. The Chest, Mirror, Dresser and Nightstand can be sold Separately. You Can Also Choose to have 2 Drawers or a Twin Trundle underneath the Bed. Twin Size Bed: 79-3/4 In. (L). x 42 In. (W). x 40-1/2 In. (H). Full Size Bed: 79-3/4 In. (L). x 57 In. (W). x 40-1/2 In. (H). Dresser Size: 33-1/4 In. (H). x 60-5/8 In. (L). x 17 In. (W). Mirror Size: 31-5/8 In. (L). x 44-1/2 In. (H). Nightstand Size: 20-1/4 In. (H). 18-1/8 In. (L). x 16-1/8 In. (W). Chest Size: 52-1/2 In. (H). X 31-5/8 (L). x 17 In. (W). The Drawers Underneath the Bed Size: (Each Drawer) 36-5/8 In. (L). x 18-1/2 In. (W). x 9-1/2 In. (H). Trundle Size: 74 In. (L). x 40-1/2 In. (W). x 6 In. (H). 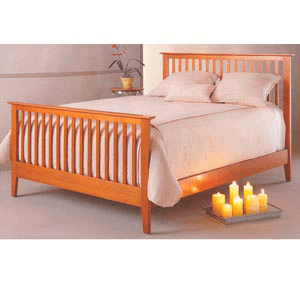 This 100 % Solid Wood Brazilian Pine Bed Is available in a Honey Pine and Mahogany Finish. This bed is Available in Two Sizes: Full (shown) and Queen. The Chest, Mirror, Dresser and Nightstand can be sold Separately. You Can Also Choose to have 2 Drawers or a Twin Trundle underneath the Bed. Full Size Bed: 81-3/4 In. (L). x 58-1/4 In. (W). x 53-1/4 In. (H). Queen Size Bed: 86-3/4 In. (L). x 64-1/4 In. (W). x 53-1/4 In. (H). Dresser Size: 33-1/4 In. (H). x 60-5/8 In. (L). x 17 In. (W). Chest Size: 52-1/2 In. (H). X 31-5/8 (L). x 17 In. (W). Mirror Size: 31-5/8 In. (L). x 44-1/2 In. (H). Nightstand Size: 20-1/4 In. (H). 18-1/8 In. (L). x 16-1/8 In. (W). The Drawers Underneath the Bed Size: (Each Drawer) 36-5/8 In. (L). x 18-1/2 In. (W). x 9-1/2 In. (H). Trundle Size: 74 In. (L). x 40-1/2 In. (W). x 6 In. (H). Springhill Bed in White Finish. Includes Headboard/Footboard Panel and Posts and Bed Frame. Headboard: 48H and Footboard: 33H. Available in Twin, Full and Queen Size. Strong Construction. Stapleton Bed in Mahogany Finish. Includes Headboard, Footboard, Wood Rails and Slats. Headboard: 45H and Footboard: 32H. Available in Full, Queen and King Size. Strong Construction. Bed With Drawers (Twin/Full). Also Available Night Stand - 24 x 16 x 24H; Mirror - 34 x 44H; Dresser - 64 x 18 x 35H; Chest - 36 x 18 x 43H. Strong Construction. Double Rail Headboard DRM-5460. Also Avaiable Dresser, Mirror, Nightstand and Chest To Complete The Set. Details: Dresser: 60 x 17 x 30..5 Drawer Chest: 30 x 17 x 48..Nightstand: 20 x 17 x 22..Mirror: 38 x 42. Strong Construction. Easy To Assemble. A Beautiful Wooden Bed With Three Drawers Underneath For Storage. Bed Comes In Queen and Full Size. Heavy and Strong Construction. Easy To Assemble.Dimension: Queen Bed: L 60 In. x W 80 In. Full Bed: L 54 In. x W 75 In. Dark Brown Finish Queen Head Board. Strong Costruction. Modern and Contemporary Design. Measures: 64-3/4 x 1-1/8 x 48-1/8H. Also Available Not Included In The Price Matching: Night Stand 5932 (IEM) 23-3/4 x 17-15/16 x 26-1/2H. Mirror 5934 (IEM) 29-3/4 x 43-3/4H. Triple Dresser 5935 (IEM) 66 x 21-3/4 x 30-7/15H. 7-Drawer Chest 5931 (IEM) 23-3/4 x 17-7/8 x 57-7/8H. Armoire 5933 (IEM) 35-3/4 x 21-3/4 x 62-5/8H. Mission Style Captain Bed In Dark Walnut Finish. This Bed Features A Twin Size Trundle With 3-Drawers Underneath. Also Available (Sold Separately) Matching Nightstand, Chest, Dresser And Mirror. Made Of Solid Wood And Venner. Strong Construction. Easy To Assemble.Dimensions:Twin: 80 In. x 44.5 In. x 39 In. (H)Full: 80 In. x 59.5 In. x 39 In. (H)Nightstand: 23 In. x 17.75 In. x 26 In. (H)Chest: 37.75 In. x 17.75 In. x 52 In. (H)Dresser: 63 In. x 17.75 In. x 34.5 In. (H)Mirror: 37.25 x 2 In. x 48 In. (H)Also Available In White Finish. See Related Items Below. Calgary Bed in Terra Finish B51B1 (FB). Includes Headboard, Footboard, Slats and Side Rails. Available in Full, Queen and King Size. Strong Construction. Cape Cod II in White B51C9 (FB). Includes Headboard, Footboard, and Frame. Available in Full, Queen and King Size. Strong Construction. Albany Bed in Sunset Finish. Includes Headboard, Footboard, Slats and Side Rails. Headboard: 50 and Footboard: 36. Full, Queen and King Size Available. Strong Construction.